This air duct lining case study highlights a unique problem faced by a Park District in Illinois. Because of the nature of the problem and the urgency involved, Trenchless Innovations quickly devised a customized air duct lining solution to the problem that resulted in long-lasting, brand-new pipes in place of the old, severely deteriorated ones. When replacing an older furnace, the Lombard Illinois Park District discovered that the 36” galvanized steel cold air return beneath it was severely deteriorated. Hoping that a simple cleaning would remedy the problem, they hired a cleaning crew to clean the pipe. This hope was dashed when it was confirmed that the bottom of the pipe was so badly deteriorated, there was no structure left to it. Trenchless Innovations was contracted to perform air duct lining to restore the piping so that the new furnace could be installed. Since the old furnace had already been removed, time was of the essence and the Park District needed a quick but effective solution to their problem. 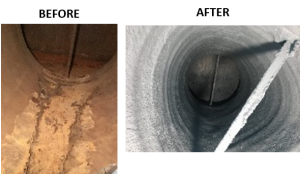 We began with a thorough visual assessment of the deteriorated piping and determined that because the deterioration was so severe, trenchless casting was necessary to first restore the structure of the pipe before the air duct lining could take place. On the day of the job, Trenchless Innovations pumped mortar into the bottom of the pipe and mortared through the entire 36” pipe. Our trenchless casting process restored the structure of the old pipe by creating a new one within it. After trenchless casting, one coating of our proprietary Duct Armor material was applied to further strengthen the pipe and restore it to like-new condition.